For more than a decade, our complete clutch and flywheel replacement system has been loved used and abused by professionals the world over. NOTHING compares for durability and enhanced performance at such a cost, without any compromises in quality components. The VAC lightweight flywheel weighs a mere 3.5 lbs, fully balanced and the super HD Tilton clutch only a few lbs itself. Replaces the wear-prone clutch fork and slave-cylinder arrangement with an annular hydraulic throw out bearing for the ultimate response and high clamping force. As used in Pro Drifting, SCCA Pro Racing, World Challenge, NASA and many many many more. 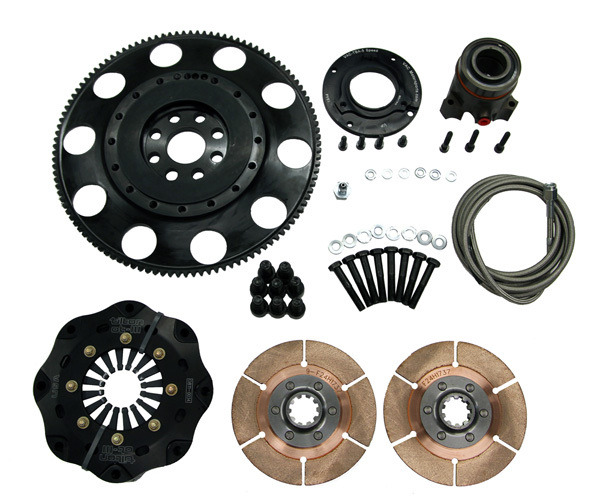 We are extremely confident that this is the ultimate Lightweight Aluminum Racing Flywheel & Clutch Kit for the M50 family of engines is the perfect choice for users who want the fastest shifts and power handling of up to 600HP with the consistency and rebuild-ability professionals must have. -Fits all M50 family engines (M50, M52, M54, S50/s52us and all S50 euro) with E36 ZF 5 Speed transmissions. -Professional installation capability and an understanding of hydraulics is a must for install of this kit. -Not intended for any street use.